On Sunday August 11, I said goodbye to my new friend, Stormy. I was a little sad to see him go, but I think he’s going to be very happy in his new home. Stormy was with me just a little over a month. You may have seen a video of him on our youtube channel. 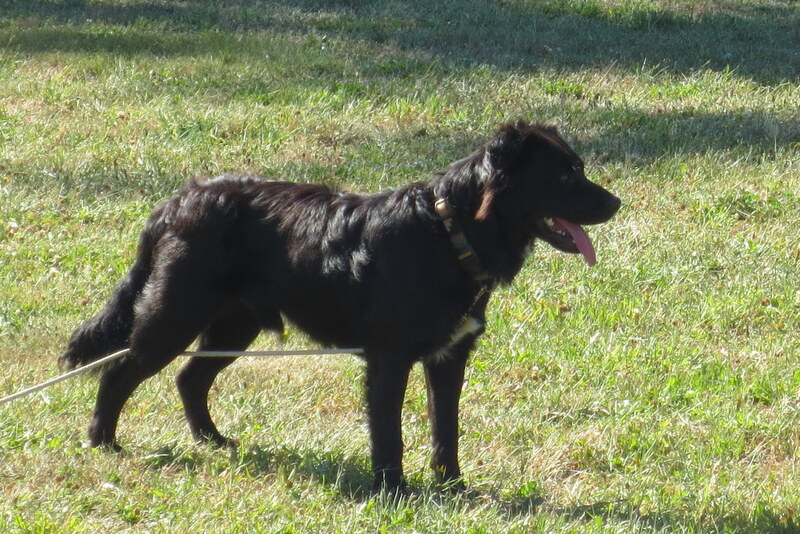 He’s a spunky little Border Collie mix that arrived here through the good graces of two ladies who have dedicated enormous amounts of time and money to helping dogs like Stormy. Stormy showed up here in a crate and he was not too happy about being put in a kennel. He had a terrible fear of men, gates, doors and anything else that hinted of physical restraint. Stormy had been found wandering in a field in Eastern Washington with two other dogs that were obvious litter mates. They were only about 8 weeks old when they were picked up as strays. Stormy was placed with a foster family, but things didn’t work out. He was allowed to run free on 20 acres, so he went from being a homeless, feral puppy to being a feral puppy with a place to go for food. Within the first hour after arriving at the kennel Stormy had already tried to bite me twice. He was extremely fearful and he DID NOT like me reaching for his collar! The first time I let Stormy into the exercise yard he did a couple quick laps and managed to pee on every fencepost (twice!) and any other vertical surface he could find. Marking territory is one thing, but this guy even peed in his own water bucket. After his first two laps, Stormy spent the next half hour trying to convince me that he was never going into the kennel again. I eventually lured him in with some food. After that first episode, I got in the habit of clipping a light, 15 ft. cord on him every time he went out. I think this helped him grow accustomed to the sensation of being on a lead and it also enabled me to catch him with a minimum of drama when it was time to go back in the kennel. Eventually his behavior improved to the point where I could let him out without the long-line. When this happened he would grab the line with his teeth and drag the loose end out into the exercise yard with him. On two occasions he managed to get ahold of the long-line and pull part of it into the kennel with him. (It was always clipped onto his kennel gate when not in use.) He never chewed or destroyed the long-line. He just piled in a corner and laid on it. It almost seemed like it had become a kind of security blanket for him. After being here about a week, Stormy went to the vet to get neutered. We hoped that being neutered would help with the marking behavior. Stormy was so busy peeing on everything that it was difficult to get him to focus on anything else. The surgery proved to be a good decision. The behavior improved almost immediately. Stormy was still in the “cone of shame” after his surgery, but we were beginning to make some real progress with his training. I knew from the beginning that Stormy would have to be trained with positive reinforcement. He had so much fear of physical restraint that I’m sure a chain collar or other aversive stimuli would have sent him into a major meltdown. In the beginning of our training I used thin slices of turkey hotdogs as a primary reinforcer. Later I switched to kibble as Stormy began to enjoy “the game” more than just the treats. The kibble was easier to use because it’s handier and cleaner than slimy hotdog slices. The timing of the reward can be very important so it’s nice to use something that can be handled easily and quickly. By the time Stormy’s new guardian came to check him out, he was well on his way to becoming a nice little gentleman. I confess to feeling a tiny bit of jealousy when this woman came to my kennel and immediately received all the trust and affection that I had to work so hard to get. That’s my Stormy! Always the lady’s man! Once Stormy began to trust people, it was like the layers of armor were finally peeling off his little dog-heart. Here was a dog that was once as suspicious of people as any wild animal. He was turning into a mushy, little lover-boy right before my very eyes! Watching him flirt and cuddle with his new human, it really seems like Stormy has found his Forever-Home at last. I want to extend a huge Thank You to all the people who were involved in finding Stormy a new home. I want to convey my best wishes to his new guardian. I would also like to say thanks to whoever decided that I was the right guy to work with this awesome little pup. I truly appreciate having had the opportunity to know and work with Stormy. Goodbye Stormy! Good Luck to you! We were wandering around on the big, grass prairie, south of Spanaway. Ft Lewis calls this “Training Area 13”, but my dogs and I think of it as our personal dog training paradise. Every summer the Army closes this area for a period while ROTC utilizes the prairie for their training exercises. It’s always a relief for me, as well as for the dogs, when the soldiers go home and we get the fields to ourselves again. Of course we’ve never had the fields entirely to ourselves. There are other people who jump through all the Army’s hoops and get registered to train or exercise there. In addition to a few humans, there is also a healthy population of wildlife, including deer, bears, bobcats, coyotes, ‘possum, rabbits, squirrels and, unfortunately, porcupines. I’ve seen all these animals on Ft Lewis at one time or another. I’ve spent a lot of time in the woods and I enjoy nearly all my encounters with wildlife. I know of some people who are afraid of running their dogs on Ft Lewis because of some recent bear sightings or because of the numerous coyotes. The coyotes can get a bit bothersome in the spring when they are mating, but we’ve never had any real trouble with them. The only porcupines I’ve seen have been the ones that have already assumed ambient temperature. They can often be seen along the road after being hit by a car. In my 53 years, after all the countless hours I’ve spent in the woods, I had never seen a live porcupine until yesterday. If I never see another live one again, it will be alright with me. I might even muster a gloating smirk next time a see one flattened on the road. If you’ve already guessed that we had a close encounter of the porcupine kind, you guessed correctly. I won’t bore you with a play by play narrative and all the gory details, but I will tell you that one of the saddest sights I’ve ever seen is a dog with a face full of porcupine quills. I had to physically separate Peck from the prickly, little beast and I got a few quills myself in the process. It was pretty dang irritating, but nothing compared to what the dogs had to endure with quills through their tongues, lips, noses and pretty much all over their front legs and paws. The dogs were out of their little, canine minds with pain. I have no idea how they managed to hear me command SIT as I made a desperate attempt to remove some of the quills that were near their eyes. This is where the training paid off and I got them to sit while I pulled out the very worst of the quills. I was unable to pull the quills in their mouths because the pain made them try to bite when I attempted to pull. I quickly figured out that I was going to need a veterinarian and general anesthesia to get all the nasty little needles out of their mouths. We headed back to the truck at a quick trot, with the dogs trying to stay as close to me as possible. I picked up a few more quills in my legs from the dogs as they tried to climb into my hip pockets as if they thought I could gather them into my arms and make the awful pain go away. They say lightning never strikes twice in the same place, but believe it or not, we were no more than twenty yards down the trail when ANOTHER porcupine entered the trail in front of us and then wandered off the trail to the right. Kaia emitted a guttural rumble and set out on a dead run directly for the wretched little critter. I screamed “SIT” so loudly that I’m sure my voice was audible in Auburn where people saw their dogs suddenly sit for no apparent reason upon hearing the force of my command. Fortunately the training paid off again and Kaia sat immediately and watched as Hell’s own little pin cushion waddled off into the weeds. We stopped a couple more times during the half mile jog back to the truck when one of the dogs became so distraught with pain that it was grinding its face on the ground in a wild attempt to dislodge the terrible barbs and escape the ceaseless torment. Once again, I used a firm SIT command to stop the potentially destructive behavior and we resumed our race back to the truck. Arriving at the truck, I loaded the dogs and headed for the vet’s office where I was allowed to take the dogs straight in to the surgery area. Within minutes the dogs were heavily sedated and sleeping while skilled hands carefully removed the quills with hemostats. I think this story underscores the importance of a reliable response to the SIT command. I preach a lot about the importance of training a reliable sit, on-lead, off-lead and remote. I try to practice what I preach. In this case it paid off in two different ways. The obvious payoff was that I was able to stop potentially destructive behavior 3 different times in the course of a few short, chaotic minutes. The payoff that might be less obvious is that I was able to remember to use the SIT command even in the midst of all the pain and panic I was witnessing. The fact that I was able to react quickly and put Kaia in a sit when she started chasing the 2nd porcupine can only be attributed to the countless bajillions of times we have trained on SIT. The fast reaction can in no way be attributed to quick thinking on my part. It was the result of training, training, and more training. I guess it’s easy to forget that all the while we are training our dogs; we are also training ourselves for our role as guardians. If you need some help getting underway with a good training program that includes a 100% reliable response to SIT, please feel free to give me a call. If I don’t answer, I’m probably out on the Ft. Lewis prairie somewhere, trying to run over a porcupine (or two) with my truck.